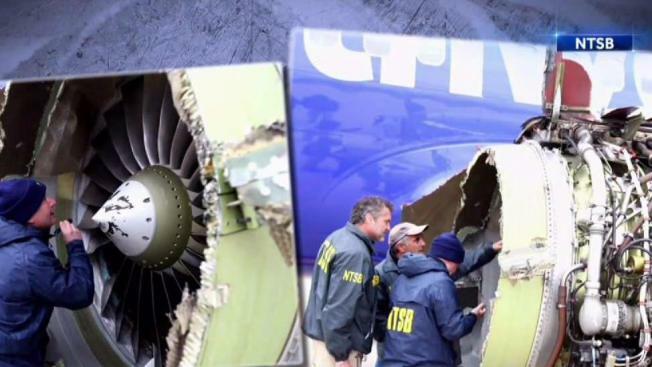 The engine of a Southwest Airlines plane that shredded apart Tuesday was set to receive an ultrasonic inspection in the months after the fatal mishap during the New York-to-Dallas flight. A representative for the airline said the inspection on was scheduled for December in accordance with the engine manufacturer's service recommendations, about eight months after Tuesday's doomed flight left one woman dead and seven others injured. But engine manufacturer CFM said the engine involved in Tuesday's mishap was not among those tagged for the inspection meant to detect microscopic cracks in the metal in 2017 following a similar engine issue aboard another Southwest flight in 2016. The airline added that the engine had logged 10,712 trips since its last engine overhaul; the ultrasonic inspection was recommended after 15,000 trips. 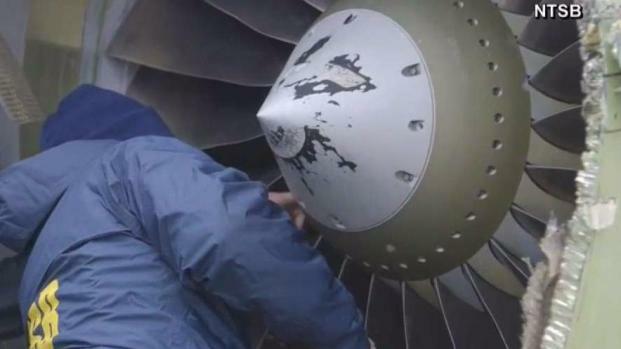 Worn-down and broken jet engine fan blades have been complaints from airlines and pilots before Tuesday's mishap left a woman dead and seven others hurt. Chris Glorioso reports. Tuesday's incident, which nearly sucked a woman out of the plane, forced the pilot to pull into a rapid descent to land in Philadelphia. The NTSB said that based on a preliminary examination, it found evidence of "metal fatigue" in the engine. But the body said it would take up to 15 months to complete its inquiry. In the 2016 incident, a Southwest Boeing 737-700 blew an engine as it flew from New Orleans to Orlando, Florida, and shrapnel tore a 5-by-16-inch hole just above the wing. The plane landed safely, and the National Transportation Safety Board said a fan blade had broken off, apparently because of metal fatigue. Images from both incidents also bear similarities, with the front housing on both engines apparently blown off. CFM said in a statement Wednesday that its blades go through rigorous inspections throughout the production process as well as periodically in the field and that issues with the engine model involved in Tuesday and 2016's incidents are "among the most reliable jet engines ever developed." Southwest said Tuesday it is accelerating inspections to its engines and that it will finish them over the next 30 days. It says it's making the move out of caution, and it's not clear how many planes in the airline's fleet of 737s use those engines. CFM added that it is helping Southwest in its inspections.